It’s Learnin’ Time: The Field School Begins! Matthew (Matty) Colvin flatters the MPP by making the 14 hour drive from San Marcos, Texas just to be with us (on his 28th birthday, no less), and Emmalea Gomberg arrived ready for work on Monday after a long Sunday flight from California. Matty will be with us for all of June and Emmalea is in for the rest of the summer. 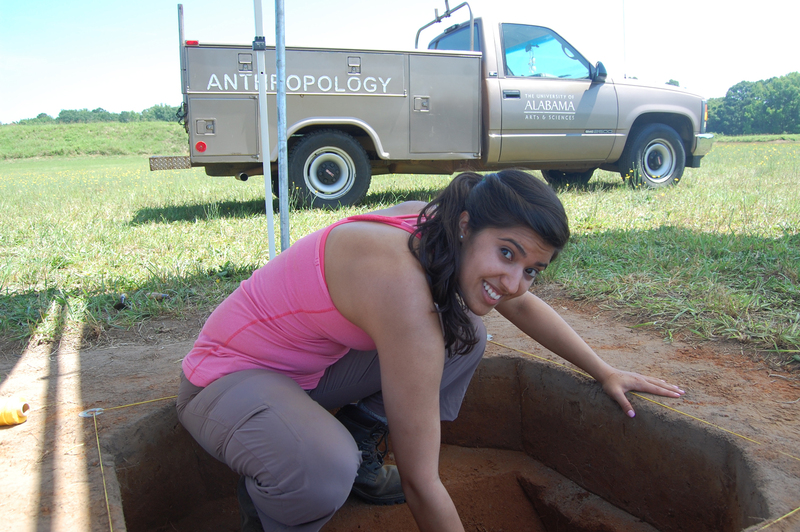 Sophia Fazal on her first day excavating the the southern half of a large post in the plaza. 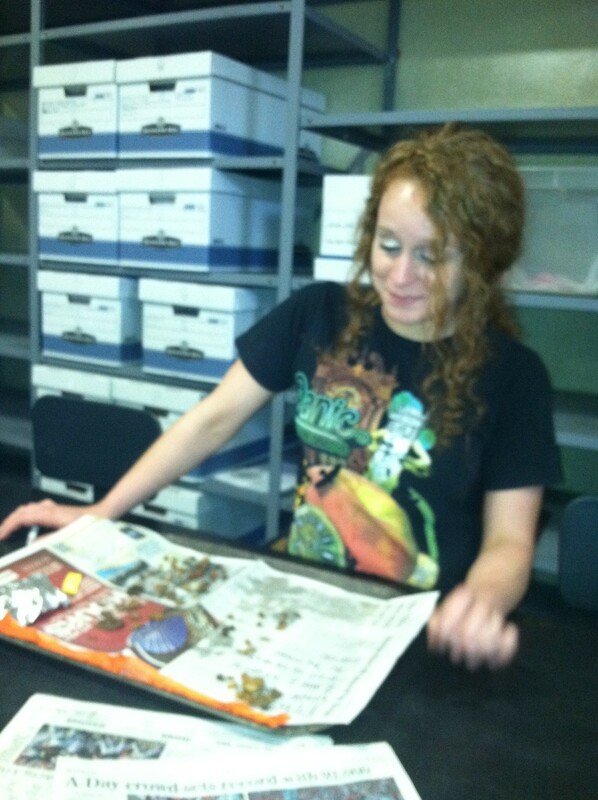 Rebecca McLaurine washing artifacts in the lab on Friday. 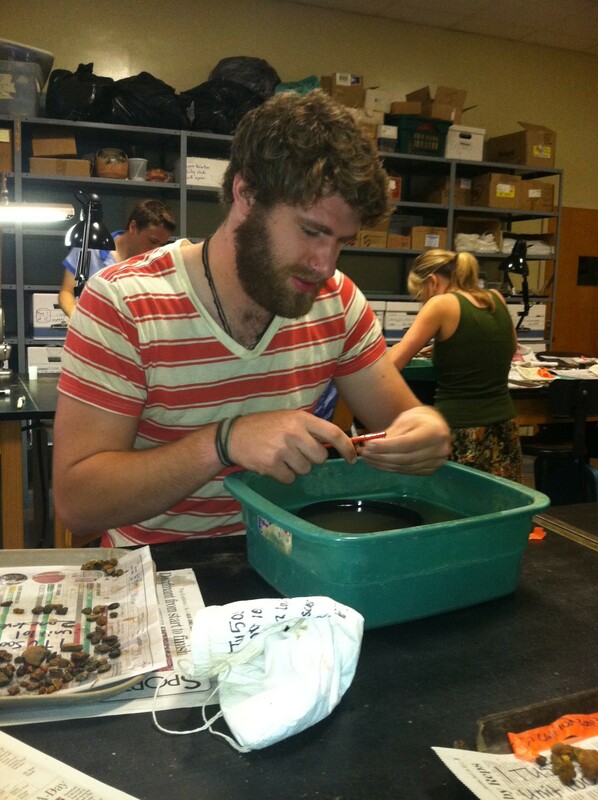 Peter Corn getting prune hands in the lab. Team 1 completed their excavation of a few posts and a second wall trench this week. They recovered several interesting artifacts in the process including fragments of decorated pottery and a beautiful arrowhead made of local stone. A sampling of the artifacts found so far: a & g) rim sherd from a noded jar (a) and a triangular projectile point (g) from one of the wall trenches; b-e) decorated and undecorated pottery (b, c, e) and a lump of fired clay (d) perhaps from a clay-covered wall or hearth, all recovered from the pit house feature; f) a beaded pottery rim from the base of the plowzone covering our wall trenches. This calls for a brief digression about the bow and arrow. Despite its pop cultural connection with Native Americans, the bow and arrow is not a weapon of great antiquity in the United States. It dates to the few centuries that immediately precede the Mississippian period, so to about AD 800-900. It is a weapon that revolutionized warfare and probably is partly to blame for the social, cultural, and political revolutions that characterized the emergence of chiefdoms in the Southeastern United States. Most things that people call “arrowheads” are, in fact, spearheads or atlatl dart points. Those things were too large to have ever tipped the end of an arrow. By mapping the spatial and chronological distribution of projectile points across the Southeast, archaeologists have documented the rapid spread of bow and arrow technology. 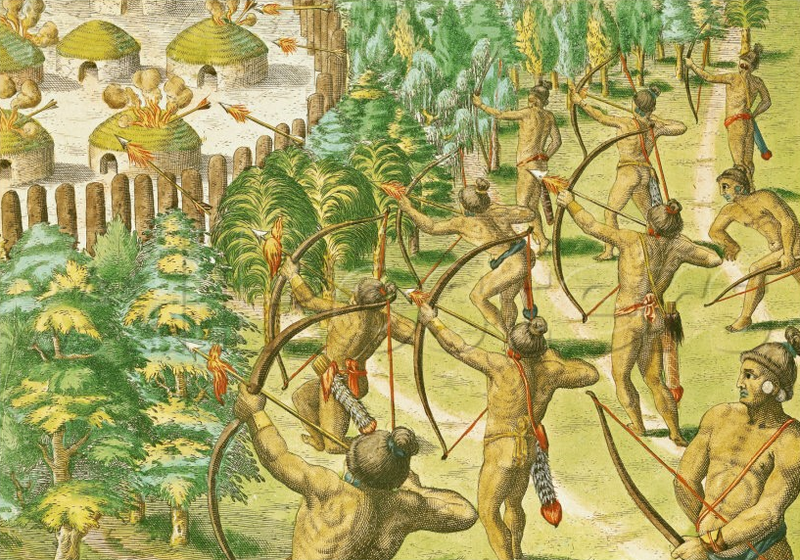 Another early historic etching (recently colorized), depicting Southeastern Indians firing flaming arrows at an enemy settlement. The bow and arrow revolutionized prehistoric warfare when it was introduced into the Southeast around the 9th and 10th centuries. We can now confirm that Team 2 has exposed the corner of an ancient semi-subterranean house. By semi-subterranean, I mean that the house had a sunken floor around which the walls and roof were erected. It is possible that this style of architecture kept things a bit cooler for the original inhabitants. Once Team 2 removed the dirt filling this sunken floor, they noticed a large oval-shaped stain that turned out to be a deep pit that may formerly have been use for storage. 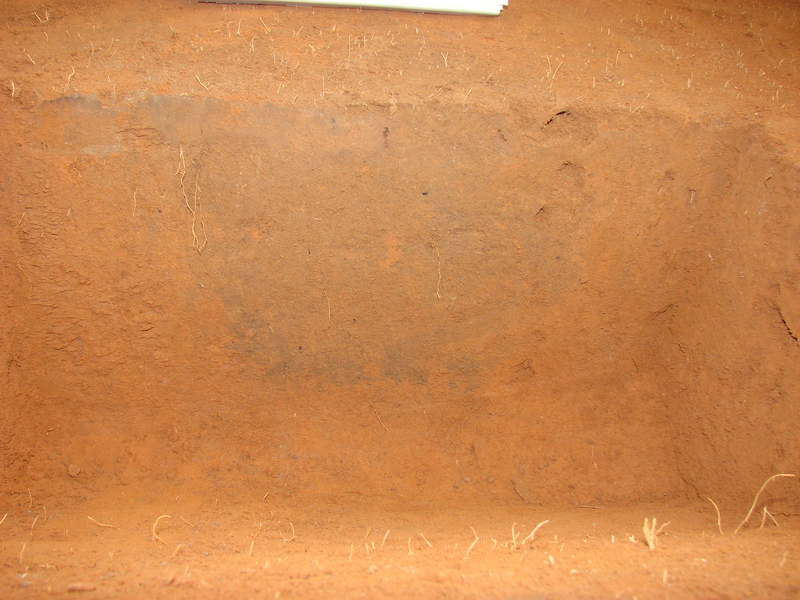 Artifacts recovered from this pit and from the dirt covering the house floor suggest that the structure was occupied sometime during the 12th and 13th centuries, when Moundville was first getting started. 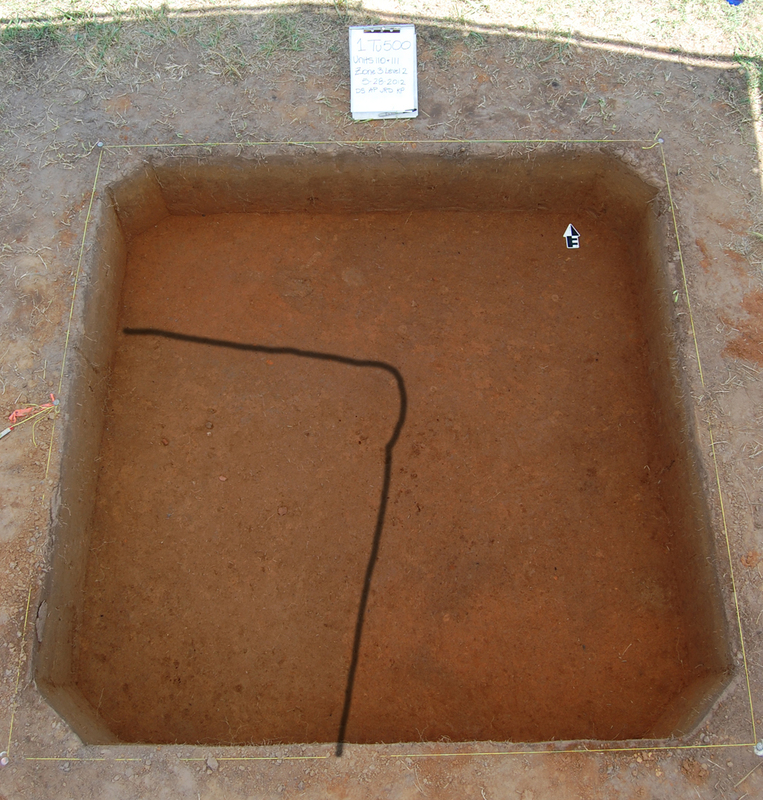 The dark yellowish brown stain in the lower left portion of the unit is the top of a rectangular pit house feature. If you look closely, you will see pieces of pottery and other artifacts sticking out of the soil. Team 3 has confirmed at least one large post in the middle of the plaza. The post feature was truncated, meaning that we only caught the bottom part of it. Presumably, historic plows or ancient plaza-builders destroyed the top part of the post stain. We are seeking more post stains. We’ll have exciting news if we succeed in our quest. The lower part of a post stain found near the center of the plaza. The post is about 40 centimeters in diameter. Team 3 bisected this feature so we could see it in profile. This week was cut short by Southern summer thunderstorms. We were prepared to work as usual on Thursday morning – our canopies up, our shovels and trowels sharpened, our pens and pencils ready to record what surely would have been yet another day of discoveries. But before we could get started, storm clouds began rolling in from the west and we retreated to the museum with the threat of thunder and lightning close at hand. Just before the bottom dropped out around 11:00, we quickly packed up and called it a day with an early lunch at Big John’s Barbecue. 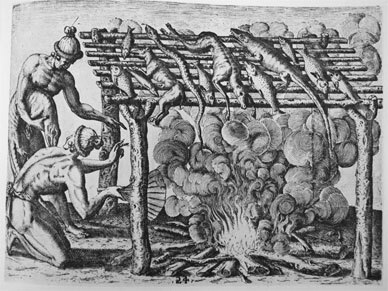 I suppose I can write this off as an educational experience, since “barbecue” is derived from word that the Spanish used (barbacoa) to describe early Native American cooking practices. An etching of early historic period Southeastern Indian barbacoa. 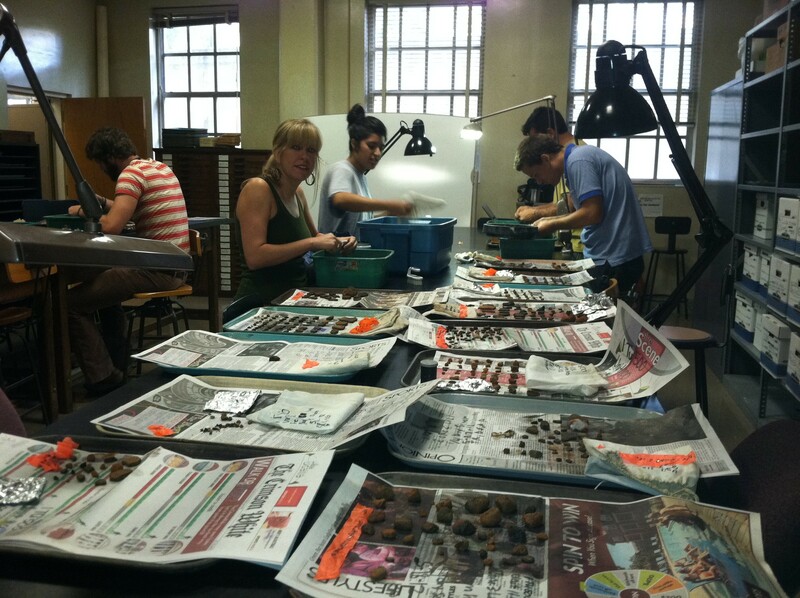 Friday was spent washing artifacts in the archaeology lab, a task accompanied by Erik Porth’s party mix and plenty of stories from me that I’m sure most of our students have heard before. It was a great opportunity to review all the things that have been found so far, though three hours with his hands in a wash basin prompted poor Peter to exclaim, “You didn’t tell me I’d get prune hands!” Archaeology isn’t all sunshine and lollypops, Peter! We took a “rain day” on Friday, even though the sun was shining. This gave us a chance to clean up the artifacts we’ve been finding. Dr. Ashley Dumas’s University of West Alabama field school visited our excavations this afternoon (Saturday). Betsy Irwin and I met them at the site for a three-hour tour of the museum and park grounds. I don’t know about them, but I had a wonderful time. Please visit their student-run blog for a recap of the visit!